Territorial Army Recruitment committee has published official recruitment draft advertisement for Infantry Battalion Territorial Army. all eligible candidates who want fill application form for the post of Territorial Army Kumaon 111 Infantry Battalion now can fill application form in the prescribed application form format which is published at Upjob.in. Infantry Battalion Territorial Army will conduct Recruitment Rally at Itanagar from 26 November 2018 to 1st December 2018. Eligible candidates and volunteer are invited to join the Territorial Army rally as per as given schedule. Physical fitness test - 1 mile race, pull up, Zig Zag, balance and 9 feet ditch will be conducted. Candidate who will be declared qualified in the physical and medical examination will be called for written examination. Soldier tradesman - 10th except housekeeper and mess keeper 8th class time. The test paper would be objective type and MCQ based. Total 1 hour time duration will be given for 100 question paper. Written test along with trade test will be conducted for tradesman and soldier clerk post. 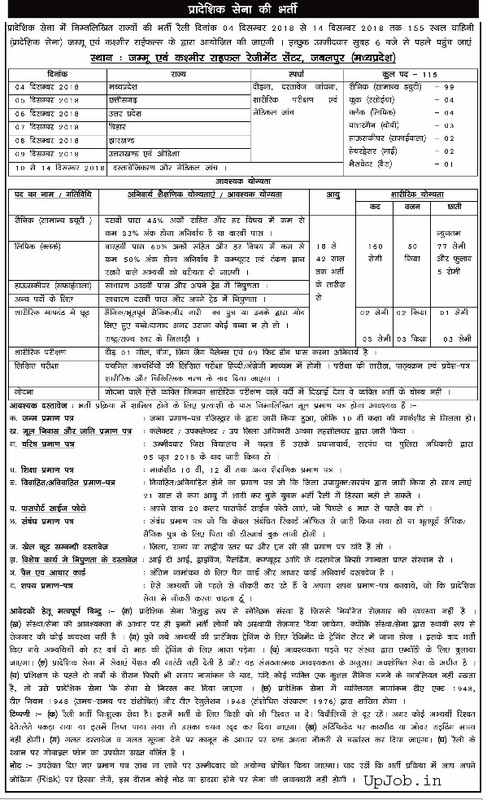 111 paidal vahini pradeshik sena kumaun , published the official recruitment notification ref No 102803/A dated 5 October 2016 for inviting application form for the recruitment constable and other category of the posts. Total no of vacancies are 31 including various categories. All those candidates who hold the eligibility criteria they can appear in rally . posts included Sipahi general duty (constable ) , chef unit kook , chef special cook , mess better . Selected candidates will be appointed in UP , Uttarakhand Bihar , Chhattisgarh , Orissa , Madhya pradesh , and Jharkhand state . This is a good opportunity for metric pass candidates .